As part of the new mandatory pre-application consultation exercise for planning applications for major development, a consultation has begun on a proposal for 7 flats and 10 dwellings for Tathan Hall ( Balfour House), St Athan. The consultation ends 13th January 2017. More details are available via the consultants web site http://www.lrmplanning.com/category/public-consultation/. 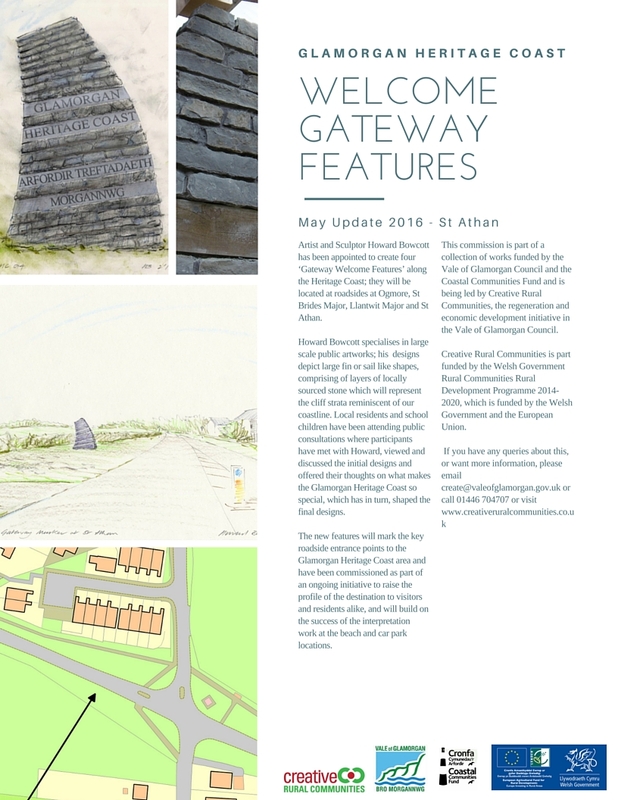 The new features will mark the key roadside entrance points to the Glamorgan Heritage Coast area and have been commissioned as part of an on going initiative to raise the profile of the destination to visitors and residents alike, and will build on the success of the interpretation work at the beach and car park locations. This commission is part of a collection of works funded by the Vale of Glamorgan Council and the Coastal Communities Fund and is being led by Creative Rural Communities, the regeneration and economic development initiative in the Vale of Glamorgan Council. If you were wondering about all the increased flying activity from MOD St.Athan, we can report that a detachment of Hawk T2 from IV(R) Squadron, normally based at RAF Valley in North Wales has de-camped to St.Athan while refurbishment work is carried out at their home base. The works are planned to be complete by early September, but while at St.Athan flying operations are expected from 8.30 in the morning until 5pm Tuesday to Friday, with possibly some limited flying on Mondays.